T he people of Gualala, a quaint coastal town some three hours north of San Francisco, know well the fog that rolls in off the Pacific Ocean. So did their predecessors, the Kashaya Pomo Indians. 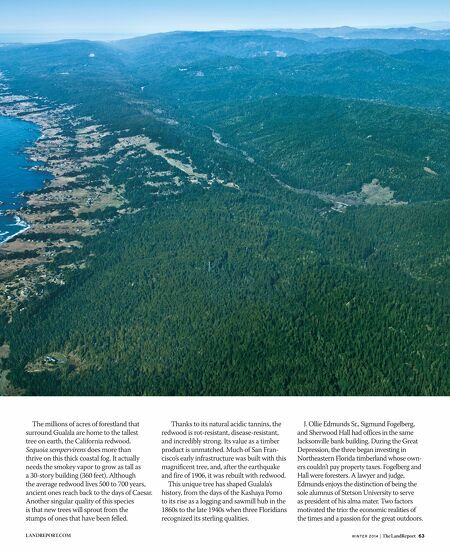 "The water coming down place" is the Pomoan name these Native Americans christened the stunning setting where the mouth of the Gualala River meets the cold ocean waters and the coastal fog seeps into the nearby forestlands, covering them like a fluffy blanket. 62 The LandReport | W I N T E R 2 0 1 4 LANDREPORT.COM A m e r i c a n L a n d o w n e r Where land meets sea, a giant thrives. 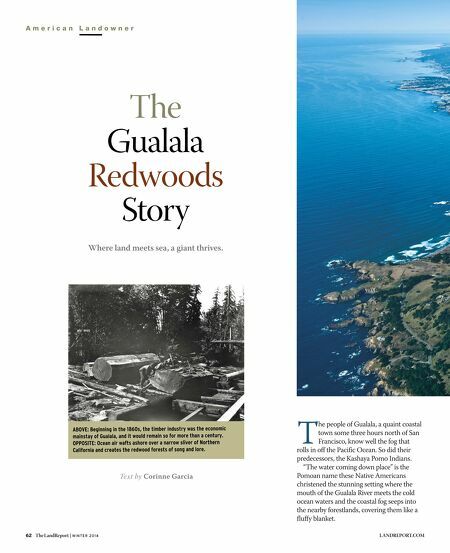 The Gualala Redwoods Story Te xt by Corinne Garcia ABOVE : Beginning in t he 1 860 s , t he t im b e r i n d u s t r y w a s t h e e c o n o m i c m a ins t a y o f Gua la la , a nd it w o uld r em a in s o f o r m o r e t h a n a c e n t u r y . OP P OS ITE : Ocea n a ir w a f t s a s ho r e o ver a n a r r o w s l i v e r o f N o r t h e r n C a lif o r nia a nd cr ea t es t he r edw o o d f o r e s t s o f s o n g a n d l o r e .